After over-indulging on a lot of rich foods over the holidays, we were craving something light and nutritious for supper tonight. 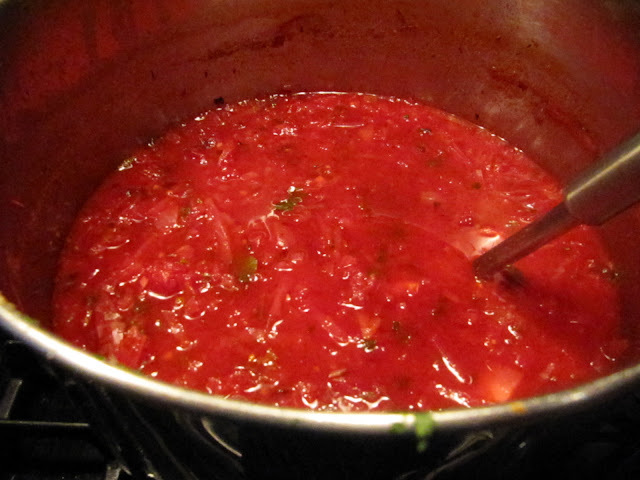 I decided to make my version of borscht (beet/cabbage soup). My version qualifies as light because we have it as our main course and because I do not add meat, potatoes or carrots as many other versions do. This is a vegetarian borscht because I use vegetable broth. You can use chicken or beef broth if you choose. It is difficult to 'ruin' this soup. Once you get the basic ingredients going you could add the potatoes and carrots to make it more hearty - but our family is not used to it that way. The list of ingredients is at the end of this post. I will describe the method with the photographs. So let's get started! The first thing you must do is cook your beets. You can boil them, but I prefer to roast them in the oven wrapped in aluminum foil. Roasting deepens and sweetens the flavor of almost any vegetable. As well, I saute the other vegetables in olive oil before adding the liquid ingredients. Sauteing adds more flavor than simply boiling them. 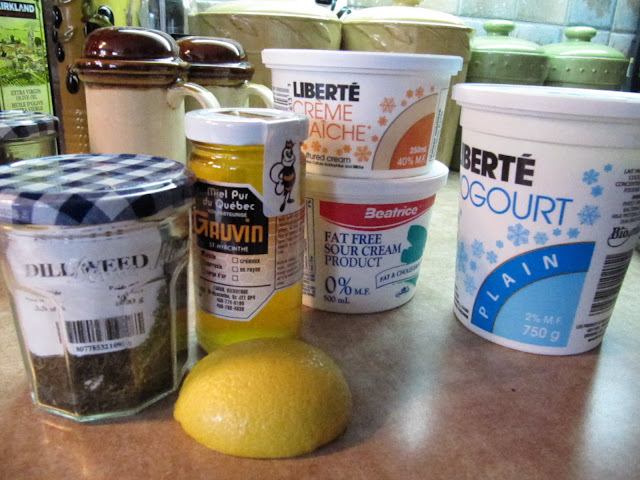 In the photo above are more of the ingredients. 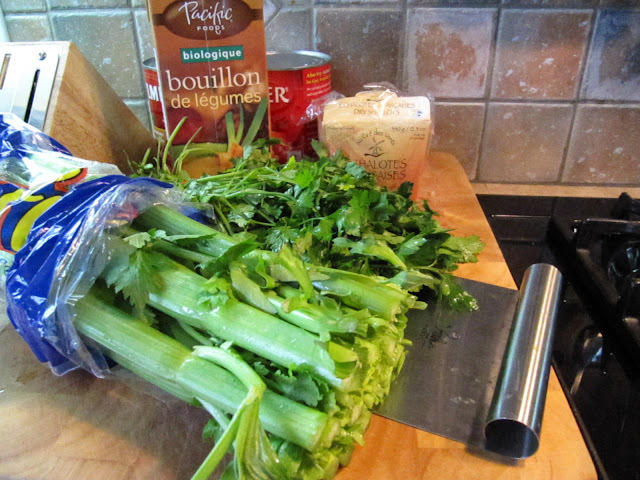 Celery seems like a mild vegetable, but in cooked dishes it can overpower everything else. So I only add a little celery for flavor. 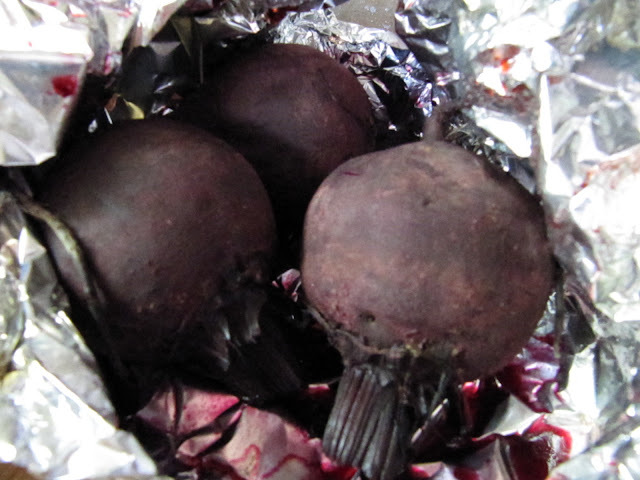 My beets have been roasted in a 375 degree over for about an hour and a half. Let them cool, and then when you can handle them, you can simply push the skins off with your fingers. They will slip right off. (Your fingers will pick up the pink color, but after a couple of washings as you continue to make the soup, the color will be gone.) 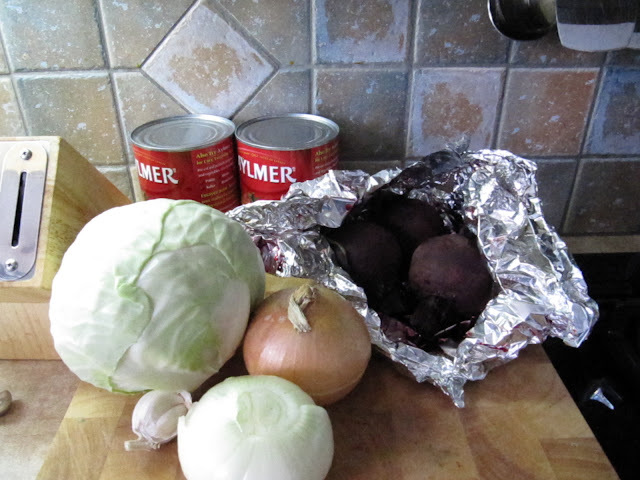 Set the beets aside, while you saute the onions and cabbage, etc. 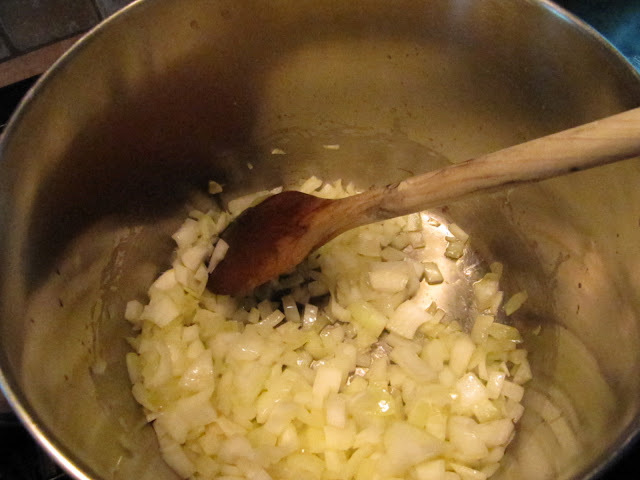 Add parsley and celery to the onions in the pot. 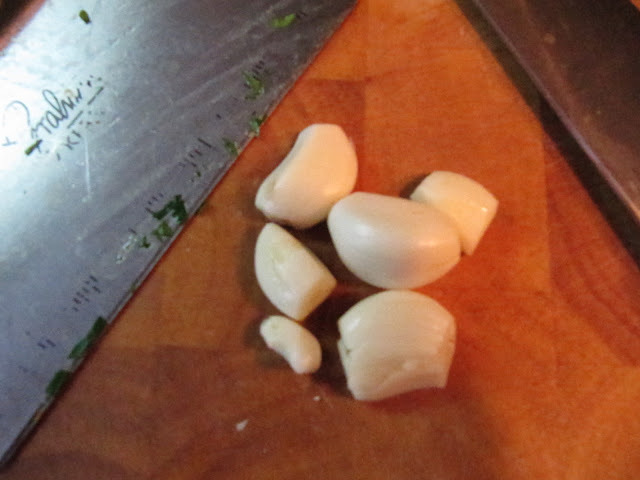 Chop lots of garlic and add half to the pot now. I add half again later after the tomatoes and beets have been added. I find adding the garlic in different batches layers up the flavor for a better result. 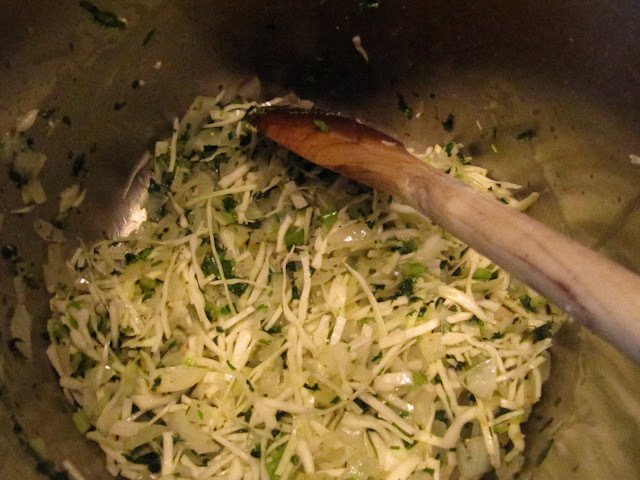 Chop your cabbage into pieces small enough to fit on a soup spoon and add it to the pot with other vegetables. 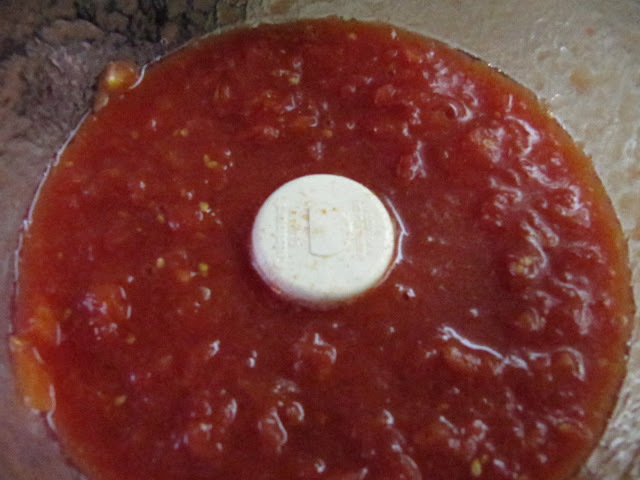 Whiz your canned tomatoes (2 cans) in a food processor or blender, just to break them up - I prefer to have a few small chunks - so watch that you don't end up with a puree. You may want to process only one can at a time, depending on the size of your food processor. 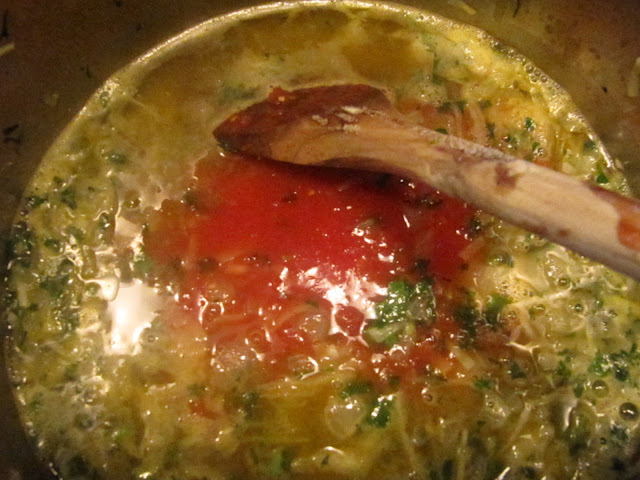 Add the vegetable broth and processed tomatoes to the sauteed vegetables. If you have not seasoned as you went along with salt and pepper, do so now. At this point, you basically have the components of a cabbage/tomato soup. If you want borscht, you have to add the luscious, jewel-colored beets. 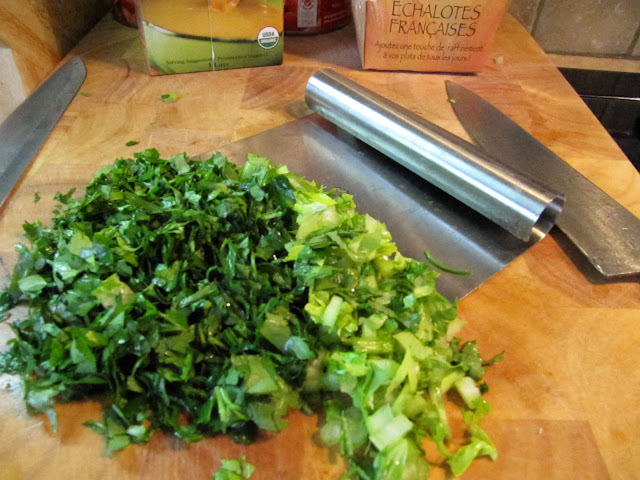 Cut them in 2-3 inch chunks and add to the processor or blender. You do not have to clean the processor after doing the tomatoes. 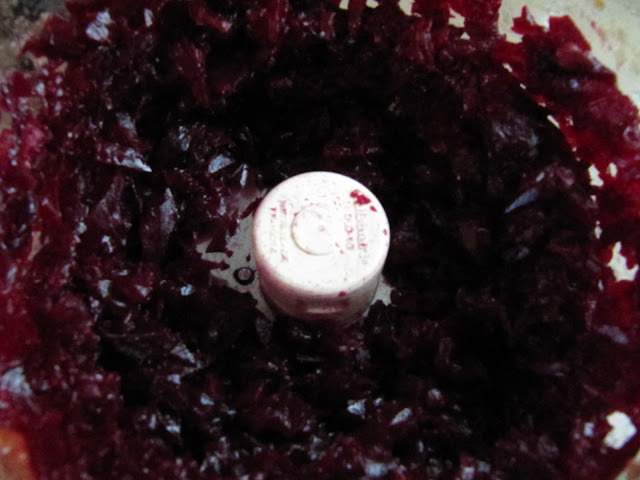 Again, don't over-process, you want the beets in small chunks so that you can tell what you are eating. Once processed they look like little garnets shining in the Cuisinart bowl. Add the chopped beets to the pot. 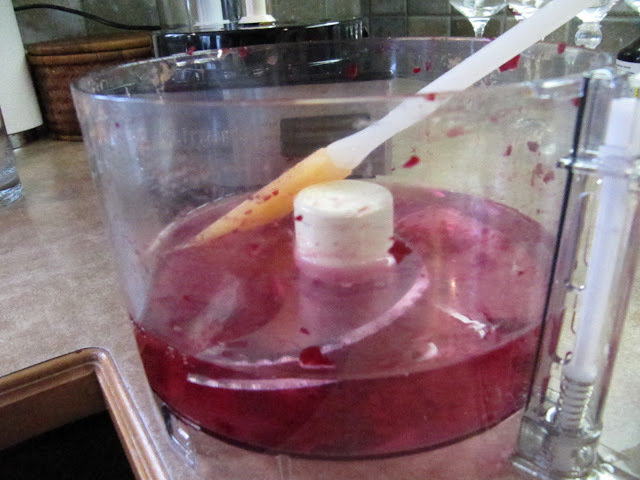 Load up your processor with water to clean out any beets that are stuck in it and pour the water into your pot. Even a few beets turn the water a beautiful fuchsia color. 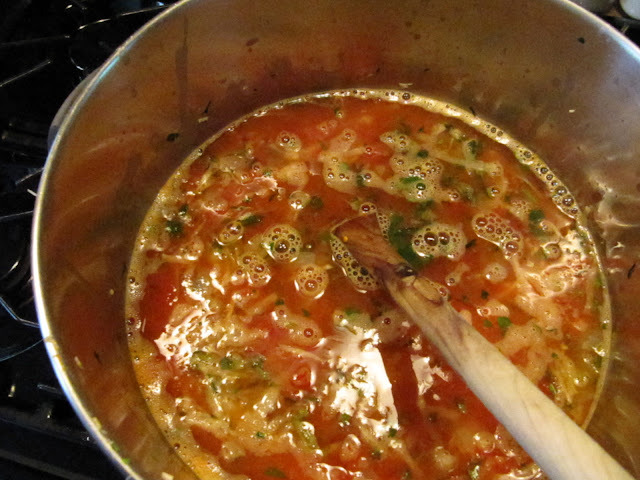 Add enough water to make a soup-like consistency. At this point I add about a tablespoon of dried dill, and two bay leaves. I just don't think it is borscht without the addition of dill. 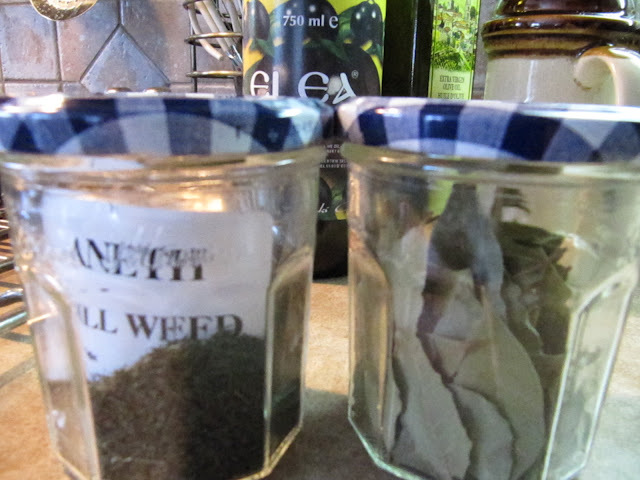 If you do not have dried dill, fresh is even better but add much more - perhaps half a cup. Reserve some of the fresh dill to garnish the soup when serving. All the ingredients are in the pot. I let it simmer for about 45 minutes, turn it off, and let it sit for an hour or two for the flavors to marry before reheating it for serving. Yum - it looks good and the house smells so inviting. 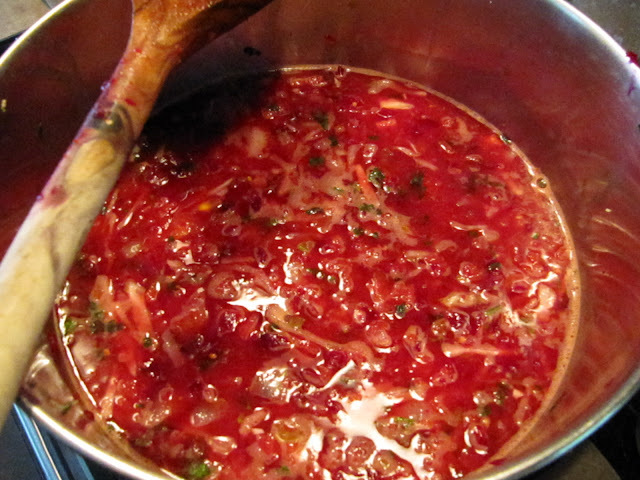 True borscht has a bit of a sweet and sour component that is added after it simmers. To get the sour, you can add a bit of red wine vinegar (1 tbsp) or a couple of tablespoons of fresh lemon juice. For the sweet, add a tablespoon of sugar or honey. Do not boil the soup after the addition of the vinegar or lemon juice. Serve the soup with a nice dollop of low fat sour cream or yogurt. Creme fraiche is yummy too, but higher in calories and fat. Sprinkle liberally with fresh dill. I did not have any fresh dill today, so I sprinkled each bowl with a pinch of dried dill. Everyone agreed that it was simply delicious! 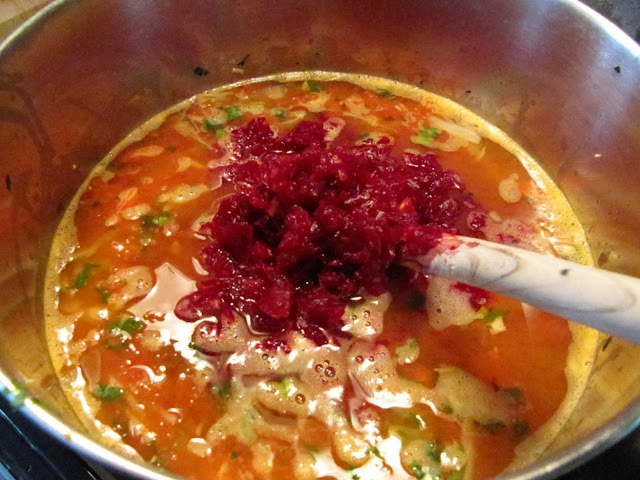 I want my borscht to be a beet soup not a cabbage soup, so I always try to include more beets than cabbage. This way it tastes of beets!! To my mind, the more beets the better. Do not let the liquid to boil after you add the vinegar. 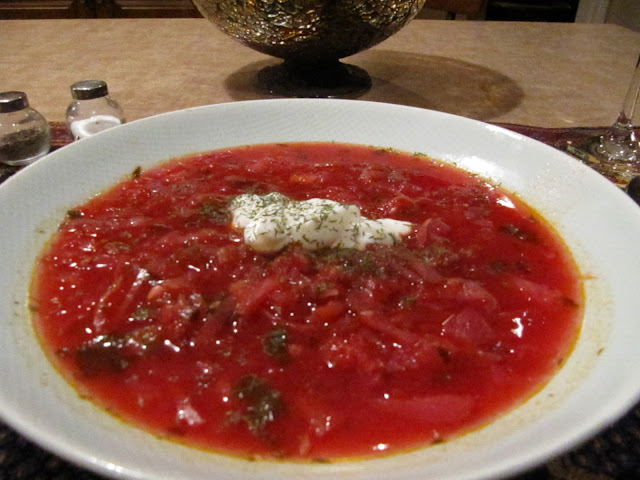 Borscht should have a sweet and sour taste and a bright, intense color. It is the best to eat the soup 1-1.5 hours after it is done or the next day. We serve it with a dollop of no fat sour cream or yogurt, and sprinkled with lots of fresh dill. As with most soups, it tastes better the next day and can last for several days in the fridge. If you are serving fussy eaters, don't tell them there are beets in the soup until after they have had a couple of mouth-fulls! This borscht recipe is a vegetarian one, but you can use a beef or a chicken stock as a base instead. WARNING: If you love this soup as much as I do and eat it at noon and supper.....do not worry if you see that your urine is reddish. 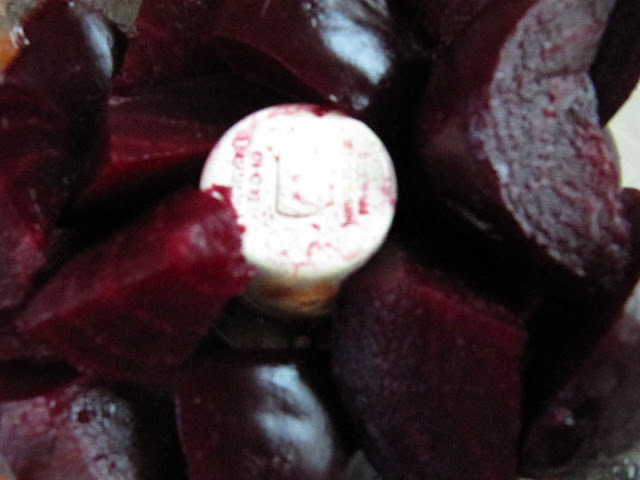 It is NOT blood in your urine, it is the beets that are coloring it. Don't want any of you worrying about your health!!! Looks yummy. And I love the way you presented it. what a delight for the eyes. I could almost smell it simmering. How can I not try it? That looks SO delicious! 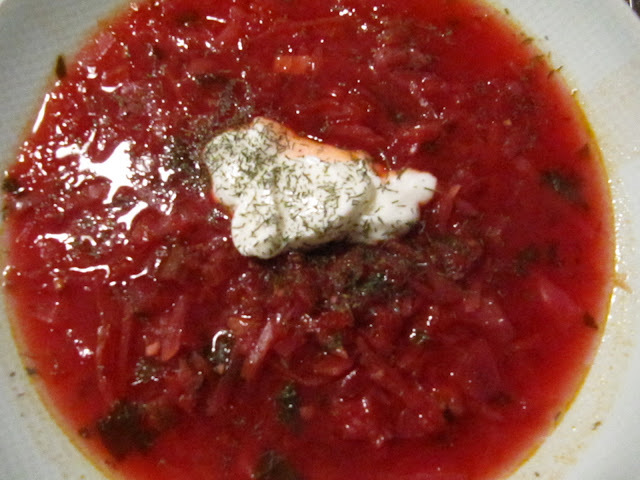 I've never tried borscht before, and have been SCARED to try cooking beets. You make it look EASY! One question..... will it freeze well? I live all by myself, and I think I would have trouble finishing the whole recipe! Ellen: It really is delicious and worth giving it a try. You do not have to follow the recipe precisely - I never measure. I just make sure not to use too much cabbage or that can really overpower the soup. Evelyn: I freeze it all the time. We are usually just two here except on the weekends. So if I make it on a weekday I freeze it. For one person I would half all the ingredients and you will still have enough to freeze some. Beets are a bit messy. After roasting them, I put them in the foil in the sink and peel them there. Then you just have to wrap up the foil with the skins and dispose of them. Wash your hands immediately after, as they will turn your fingers pink! They say the darker the fruit or vegetable the more nutrients there are in them - so I'm sure beets are one of the best vegetables. I hope you give it a try. I will be sure to try your borscht recipe Bonnie. Homemade soup is what we had New Year's Eve and Day! Yum!! I love beets. I'm gonna have to give this one a shot. Soups are not my forte. But I will try it. 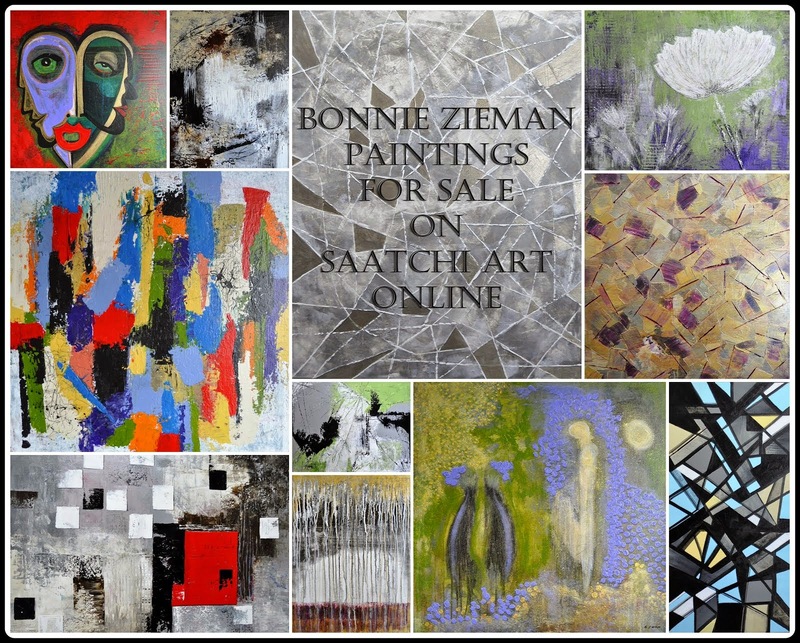 Thanks, Bonnie! WOW! That looks fantastic! Thank you for the play by play. That's exactly what I need if I'm to cook! this looks delicious even in 30C. I will try a batch soon. I wrote to you on your Gandhi post but between my iPhone my fingers and me it slipped into the ether. I am looking forward to a new mac this week, then I will be operational again. nice. you know i dont think i have ever tried it...and i just might get teh boys to eat it if i tell them it will color their pee...lol. Hi Delwyn! I recall seeing an episode of Nigella Lawson's cooking show, where she put on a 'pink' luncheon for the ladies - in the garden on a hot summer's day. One of her 'pink' items was a cold borscht soup. The 'ladies' seemed to ooooh and aaaaah over it. You could try serving it cold in your 30 degree heat! Brian! Now THAT would be a novel way of cajoling your kids into eating soup: it will change the color of your pee!!! I am crazy about borchst and have had many different kinds, this looks delicious. I have never heard of roasting the beets. LOL Bonnie..loved tha last bit! Giggle! That would be a bit of a surprise. Truly a woman of many talents! Do you need to stay in a private place after eating this delicious soup? PS Your blog is one of the reasons I blog. Aaaah Friko, you are so sweet - I, too, value the relationship we have constructed here and hope it continues for many moons. Thank you for your expressions of kinship.